Foreign activists announced their intention to stage a sit-in outside the Israeli embassy in Amman next Thursday in protest at preventing them from entering the Palestinian territories and in solidarity with the Palestinian people. Olivia Zemor, spokesperson for the 'Welcome to Palestine' campaign, said members of the campaign anticipated the Israeli step, noting that the Palestinian people are really inside a big prison. The Welcome to Palestine Campaign decries the Israeli denial of entry via the Allenby Bridge to over 100 international activists who wanted to visit the occupied Palestinian territories, Zemor told a press conference in Amman. “The denial of entry today at the Allenby Bridge border crossing from Jordan shows that the previous policies of siege and isolation continue,” organizers said. The activists talked about their first visit to the Palestinian refugee camps in Amman. The Welcome to Palestine volunteers visited Baqa’a, Jarash and Wahdat refugee camps where they handed out the school supplies which they were carrying for Palestinian children in Bethlehem. The campaign called on "Western and Arab governments to boycott Israel for being an apartheid regime", appealing to everyone to "act to break the siege imposed on the people of Gaza." Activists from the “Welcome to Palestine” campaign said on Tuesday they would make another attempt to enter the West Bank this year after Israel’s third ban on Sunday. “We are not going to wait for another year or two. We will try again sometime this year. We will come back more frequently to say lift the Gaza siege, lift the siege on Palestinians in the West Bank and Jerusalem,” Zemor confirmed. The Palestinian Centre for Human Rights (PCHR) strongly condemns the denial of entry into the West Bank of dozens of international solidarity activists participating in the “Welcome to Palestine Campaign”. The activists, who sought entry to the West Bank via the Allenby Bridge from Jordan on Sunday evening, were sent back by the Israeli authorities. PCHR calls upon the international community to exert pressure on the Israeli Occupation Forces (IOF) and compel them to allow these activists to have access to the Occupied Palestinian Territory (oPt). Activists have the right to express their solidarity with the Palestinian just cause. Their rights should not be violated by Israel or other countries, which granted security facilities to Israel and took measures against them in their airports and through their airlines to prevent activists from access to the oPt. The IOF has a long standing policy of preventing international human rights activists wishing to observe human rights violations committed by IOF in the West Bank and the Gaza Strip from entering the oPt. Additionally, several international solidarity groups were denied entry when arriving at the Israeli airport Ben Gurion, including two “Flytillas” that were organized by the Welcome to Palestine Campaign. The participants’ stated intention to visit Palestine on arrival at the airport resulted in their detention and subsequent deportation and blacklisting. The activists are denied freedom of movement and access to the oPt in order to prevent them from baring witness of life under the Israeli occupation. 1. Stresses its support for continuing efforts exerted by international solidarity activists in support of the Palestinian people. PCHR appreciates the important role played by these activists who advocate for the rights of Palestinian civilians and speak out against the human rights violations committed against the latter by the Israeli authorities and settlers. 2. PCHR calls upon international organizations, including human rights organizations, bar associations and international solidarity committees to continue and expand their efforts in bring to justice Israeli war criminals, and to urge their governments to bring those criminals to court. Ahmed Attoun, the exiled Jerusalemite MP, has condemned Israel for blocking the foreign peace activists’ entry into the West Bank to visit the Palestinian territories and support Palestinian citizens. MP Attoun stated in comments published by the Media Office of the MPs for the West Bank, on Monday that "this prevention is part of the Zionist arrogant policy against all those who want to express sympathy with the Palestinian people," stressing the need to confront the Israeli restrictions against the peace activists and to repeatedly try to visit Palestine in order to expose the Israeli violations of the rights and freedoms." He said: "preventing international solidarity activists from entering the West Bank shows Israel’s concern about disclosing its crimes and policies of ethnic cleansing against holy shrines, land, and people in Palestine as well as its fears of unveiling its true image and the falseness of its alleged democracy". The Jerusalemite MP appealed to the international community to deter Israel and impose international isolation on it. For his part, MP Daoud Abu Sir, stressed that preventing tens of members of "Welcome to Palestine" campaign from reaching the Palestinian territories represents an Israeli desperate attempt to cover up the abuses and crimes it is committing against the Palestinian people. Abu Sir said in a statement on Monday that the occupation has been trying to prevent the arrival of any delegation or figure whose visit to Palestine may expose the practices of Israeli occupation forces against Palestinian people and land. The MP for the city of Nablus called on the human rights organizations and the media to combine their efforts in order to reveal the Palestinian people’s suffering under occupation. Member of the Executive Committee of the Palestinian Liberation Organization (PLO), Dr. Hanan Ashrawi, stated that the Palestinian Authority in the West Bank is holding talks with Jordan regarding “Welcome To Palestine” peace activists denied entry by the Israeli Border Authority, while trying to cross into Palestine from Jordan. Dr. Ashrawi said that Palestinian President, Mahmoud Abbas, “is personally following the issue”, and that the Palestinian Ambassador in Amman, Ata Al-Khairy, and several officials are conducting talks with Jordanian officials. On Sunday, Israel denied entry to members of the “Welcome To Palestine” solidarity group as some 100 internationals, who wanted to visit Palestine, tried to cross through Al-Karama Bridge between Jordan and occupied Palestine. All border terminals in the occupied West Bank are under full Israeli control. "The Welcome to Palestine (WTP) Campaign decries the Israeli denial of entry via the Allenby Bridge to over 100 internationals who wanted to visit us in the occupied Palestinian Territories. 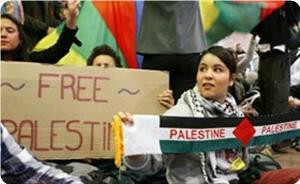 Two previous WTP delegations tried to enter the occupied West Bank via the Ben Gurion airport in July 2011 and April 2012. In both cases, Israeli authorities denied access en masse to hundreds of visitors whose only “crime” was declaring honestly that they are coming to visit people under occupation. The Israeli authorities’ excuses were shown to be lies. Even Israeli authorities admitted to fabricating lists to give to airlines used to deny international visitors from boarding”. Dr. Ashrawi said that international solidarity campaigns are a proof of international rejection of Israel’s illegal occupation of Palestine, and its illegal siege and violations. The official saluted the international activists who peacefully challenge the illegal Israeli occupation, and Israel’s arrogance that does not only target the Palestinians, but also targets the International community. On his part, Palestinian Legislator, secretary general of the Palestinian National Initiative, Dr. Mustafa Barghouthi, said that by denying entry to the peace solidarity activists, Israel is exposing its violations and its illegal policies. “Our friends, the solidarity activists, have the right to visit Palestine”, Dr. Barghouthi said, “They have the legitimate right to express their popular and political support to the Palestinian people, and their just cause and peaceful struggle”. The denial of entry today (Sunday, 26 August, 2012) at the Allenby Bridge border crossing from Jordan shows that the previous policies of siege and isolation continue. The siege on the occupied West Bank, just like the siege on Gaza, is immoral and illegal and must end. The Welcome to Palestine (WTP) Campaign decries the Israeli denial of entry via the Allenby Bridge to over 100 internationals who wanted to visit us in the occupied Palestinian Territories. Two previous WTP delegations tried to enter the occupied West Bank via the Ben Gurion airport in July 2011 and April 2012. In both cases, Israeli authorities denied access en masse to hundreds of visitors whose only “crime” was declaring honestly that they are coming to visit people under occupation. The Israeli authorities’ excuses were shown to be lies. Even Israeli authorities admitted to fabricating lists to give to airlines used to deny international visitors from boarding. Israel also continues to deny the Internationally-recognized right of millions of Palestinian refugees to return to their homes and lands. By isolating the remaining Palestinians from the eyes of the international community, Israel confirms that it is an apartheid racist state. At one point an Israeli position presented to the International media was that visitors could come through Jordan to go to the Palestinian Authority areas in the West Bank. The denial of entry today (Sunday, 26 August, 2012) at the Allenby Bridge border crossing from Jordan shows that the previous policies of siege and isolation continue. The siege on the occupied West Bank, just like the siege on Gaza, is immoral and illegal and must end. Even prisoners are entitled to be visited. When governments fail to act, individuals act. 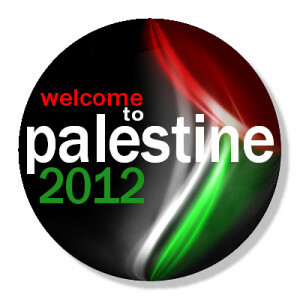 We thus will continue to initiate more Welcome to Palestine campaigns. We insist on the freedom of entry. As Israel persists in these unjust policies, it is only fair to ask all countries to reciprocate by denying Israelis entry to these countries. We will not give up, and we will keep trying. The Activists will make a Press Conference at 2:00 p.m. in Amman before they leave to Palestine! 13.45 Activists just left to Jordan Bridge from Amman! 14.53 activists are expecting to reach Jordan bridge within Half an hour! 15.48 activists are on the Jordan bridge right now! please stay tuned for more news and posts! 15.48 activists are expecting to pass the Jordanian terminal easily, while problems might rise when they reach the Israeli terminal! The Jordanian police declared to Welcome 2 Palestine have no problem with the campaign, even if the Israeli government will not allow them to pass, they are going to send them to their side. activists are chanting FreePalestine in the Jordanian terminal! activist said that the Jordanian police informed them that the Israeli side might close the bridge early today, saying its because of the huge number of people, while the activists believe its because of the campaign! chanting is going out loud while they are moving towards the Israeli terminal from the Jordanian side! 16.14 they are moving forward to the Israeli terminal now! unusual high media presence on the bridge on Palestinian side right now! activists are expecting Israel to close the bridge in front of all the travelers, claiming that their number is huge, while opening or closing the bridge have nothing to do with number of people traveling in it! 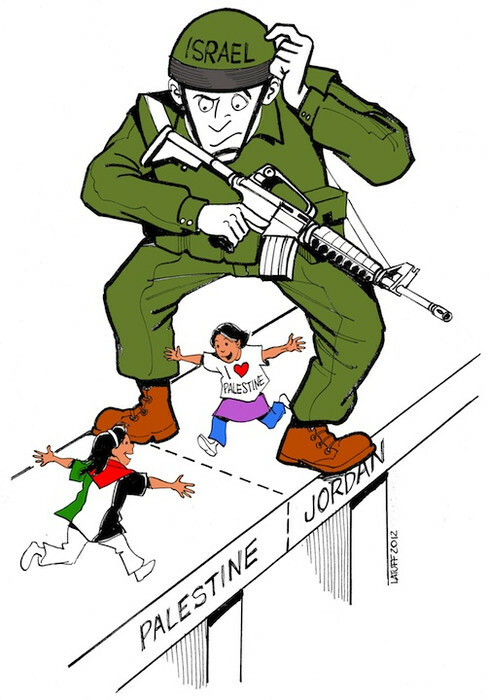 The Jordan authority said that they don't want to be responsible for anything regarding Welcome 2 Palestine and they will allow everybody to pass! 16.24 activists are moving in the buses towards the Israeli terminal despite warnings! activists are chanting out loud while they are moving in the buses to the Israeli terminal, despite the Israeli warning though the Jordanian authority! activists said that the Jordanian police is wishing them a safe trip into Palestine! activists are expecting that Israel will send all the buses back to Jordan terminal, or that they will close the bridge completely to make pressure on activists and organizers! unconfirmed news: Israel closed the bridge totally! activists are expecting to reach the Israeli terminal within 20-30 minutes! Why they should ask for an Israeli permission after all? reports are saying that the Bridge is still open in total, not closed at all! some delays are reported in processing with passports from the Jordanian side, the rest of the activists stopped and are waiting for the rest to join! well, most of them passed already, waiting for the rest of the passports to be checked, and (cont) then moving to the Israeli terminal! activits counting their passports, then heading to Israeli terminal. activists are still between the Jordanian-Israeli area, none of them reached Palestine yet! unconfirmed news: Israel closed the Allenby bridge! activists are in the Israeli terminal! activists are demonstrating at the last Jordanian checkpoint before getting into Israeli side. Israeli said its not going to welcome the activists into its side!! Breaking News: "Confornation between welcome2palestine activists and Israeli occupation forces now at Allenby Bridge"
the second bus were stopped at the last Jordanian checkpoint, and they were banned from moving forward to the Israeli side, therefore they went out of the bus and started to demonstrate as well, and got the Jordanian army surrounding them! activists are refusing to go back on both Israeli and Jordanian checkpoints, and wants to enter Palestine. no one knows what will happen next with them! 2 business were split, one on the Israeli boarder and got "Entry Denied", the second is unable to get into Israeli side! 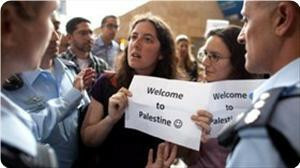 Israel and Jordanian Authorities sent back all the activists back to Jordan to unidentified location! Jordanian activists are back home, after closing the bridge! a group of Welcome2Palestine activists are going to try to cross the bridge again tomorrow! Over one hundred international peace and human rights activists, who are planning to visit the occupied Palestinian territories, are scheduled to arrive at the Allenby Bridge Sunday afternoon. The activists, mostly Europeans, are planning to tell Israeli security that they want to come to Palestine as part of the Welcome to Palestine campaign. Dr. Mazin Qumsiyeh, a spokesperson of the campaign told IMEMC "It is not clear yet, whether Israel will allow them in or not.". In previous attempts, in July 2011 and again in April 2012, Israel prevented activists who said they are coming to Palestine from entering the country, and forced airline companies to cancel the reservation of around 1200 activists. The activists of Welcome to Palestine campaign are hoping to visit with the Palestinians and accompany students on their first day to school. In a press release issued by the campaign organizers, they stated that one of the main purposes of the visit is to bring school stationary to students as an act of solidarity. Over fifteen Palestinian civil society organizations and groups and political parties sent invitations to the visitors to come and visit them in Palestine. Israel claimed last April that activist should come through Allenby bridge if they want to visit the Palestinian territories, instead of coming through Tel Aviv airport. The degelates spent three days visiting Palestinians in refugee camps in Jordan. They will also visit the Jordanian trade unionists today before heading to the Allenby Bridge border crossing.